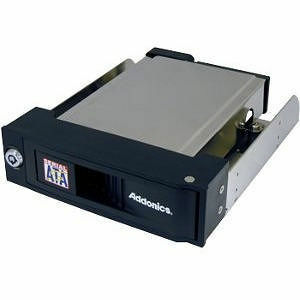 The Snap-In SATA Mobile Rack for 3.5" SATA hard drives is the best cost effective solution for hot swappable removable hard drive systems without the need for a hard drive enclosure. The Snap-In SATA Mobile Rack is designed with intentions of convenience and ease of use. Open the drive door, and the hard drive will be automatically detached from the Snap-In SATA Mobile Rack and ejected for easy removal. Close the drive door, and the hard drive will be firmly locked into the cradle and powered on. By attaching one of our optional converter boards to the back of the Snap-In SATA Mobile Rack, the Snap-In SATA Mobile Rack can then be interfaced into any computer via IDE, USB, or SCSI interface. The Zebra Snap-in Mobile Rack, the Snap-In Mobile Rack installed inside the Zebra eSATA or eSATA/USB drive enclosure, is a convenient external removable hard drive system. When attached to system via USB 2.0 or a hot swappable eSATA port, hard drive of any capacity can be conveniently added or remove from the system, similar to a tape cassette. With eSATA connection, the hard drive in the Zebra Snap-in Mobile Rack can also be used as the main drive to boot your system and for running all your applications.